Accommodation providers and tour operators throughout Mozambique are hailing the government's announcement that all visitors to Mozambique are now eligible for visas at borders equipped with the equipment necessary to issue biometric visas. 26 border posts have been issuing these visas since 2005 but there has been considerable confusion regarding which country's nationals were eligible with many Mozambican Embassies telling travellers that they must get them before travelling to Mozambique. 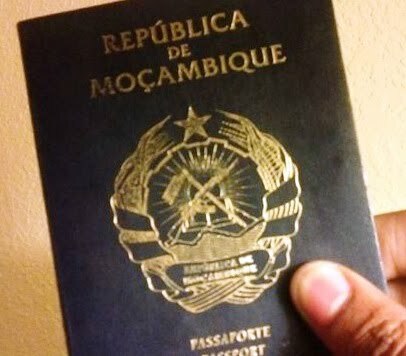 In the height of Mozambique's boom in 2014, before the current economic crisis, confusion in the law led to some travellers being refused visas at Maputo airport. The previous law in its literal form was still unclear leaving the decision open to interpretation. But this announcement has cleared the way for increased visitors from countries other than our neighbours who currently account for more than 80% of leisure tourists to Mozambique. "This is an important step in opening Mozambique as a popular tourism destination rather than just a destination for hardy travellers, its a very important first step by the government," an impressed Blake Gray from Mozambique's largest Tourism Publicity company, Connection lda, told us. "This question has caused so much confusion to people planning their holidays and countless potential travellers have just decided to go elsewhere. We have been campaigning for clarity regarding this issue with INATUR for some time. What is most strange is that our research has shown over the last three years that travellers have been getting their visas at the border anyway, this announcement finally shows potential visitors that they are welcome." A total of 44 borders will now being issuing biometric visas to visitors with the remaining 14, in many of the least-crossed land borders, to be able to issue them in the near future. 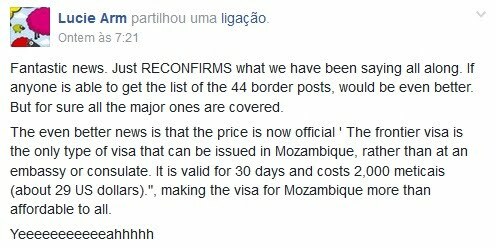 The cost of the visa is 2.000 mtn which with the current exchange rate is about $30 USD however we have seen that borders are still charging up to $80USD if one does not have Mozambican currency. It is believed that double-entry entry visas will also be issued upon request at borders.